November, 1964. Since our last post, the Doctor, Ian, Barbara and Susan have battled the alien Voord and visited the planet of the Sensorites, been caught up in various escapades in Earth’s history, and, most recently and oddly, shrunk to one inch tall. Now, at World’s End, they’ve arrived back where it all began – in what looks like a junkyard in London. The opening episode of The Dalek Invasion of Earth consciously evokes An Unearthly Child. For a few minutes at least, the TARDIS crew believe that they’ve accomplished their year-long mission to return Ian and Barbara home. But it’s a false hope. And by the end of the story, this crew, this strange family who have grown together over the past 12 months, will be torn apart. The story is interesting because it subverts what’s become the typical approach since, really The Daleks where the TARDIS crew explore their environment, try to work out where they’ve landed and only gradually understand the danger they’re in. Here, Terry Nation takes the familiar and gradually starts to make it unsettling. To an extent, this production team already tried that out in the last story, but this goes one better by actually pulling the rug from under the characters’ feet – Ian and Barbara’s joy of returning home gradually turning to horror as they discover the corpse in the river, the body in the warehouse, and the sinister posters warning it’s forbidden to dump bodies. And in the following episode, Nation makes us look askew at the familiar sights London by juxtaposing them with Daleks in Trafalgar Square and on Westminster Bridge. And in making London suddenly alien and unfamiliar, he is pre-empting a whole vast sub-genre of Doctor Who – in later years we’ll get supercomputers in the Post Office Tower, Cybermen outside St Pauls and the Great Intelligence in the Shard. But Nation got there first, inventing the Yeti on the Loo scenario. Partly, this is just Nation going one better on his last Dalek script. I noted that the dead planet is a neat stand-in for a post-nuclear Earth. London here is as deserted and eerie as Skaro, and the story takes great delight in making the city seem as frightening as any alien world. And if the survivors are just human Thals, and the saucer is merely a stand-in for the earlier story’s Dalek city then it doesn’t really matter – the imagery is strong enough to make this a striking step forward in what this series can do. That’s not the only step forward. 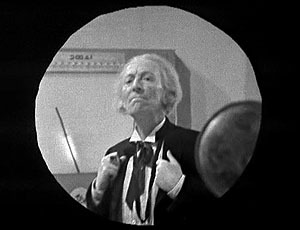 The second episode is notable for giving us, at last, the Doctor as an implacable opponent of evil, dedicated to confronting the evils of the universe. Unlike the cranky alien Doctor of The Daleks, you sense that, even if he could just get back in the TARDIS and fly away, the Doctor would no longer be able to contemplate that course of action. Instead, he pledges to “pit his wits against [the Daleks] and defeat them”. So, what we have is an entire planet under the control of the Daleks, and the Doctor believes that he, a teenage girl and two schoolteachers from 1963 can bring them down. And, incredibly, we believe him. Not only that, but then he proceeds to mock their ambitions and call them pathetic. A whole raft of later scenes where the Doctor faces off against, and taunts, the villains –Tom Baker confronting Broton, David Tennant baiting the Sycorax leader, Matt Smith besting the Great Intelligence – start here. If you watch The Dalek Invasion of Earth conscious that, regardless of broadcast dates, it was made as the end of the first production block – the show’s first “series finale”, if you like – it makes a lot of sense, as it brings to a head the character development of the first year. We started off last November with a mysterious and aloof character who, through his experiences with Ian and Barbara across those first 13 weeks, mellowed. Even then, on Marinus or in Mexico his concern was never to intervene in local difficulties, merely to explore and get back to his Ship and on to the next destination – hopefully Sixties London so he could divest himself of his kidnapped passengers. In The Sensorites, he finally took the plunge of investigating the Sensorites’ illness, but that was more akin to solving a puzzle than taking on evil. But now, he’s suddenly the self-appointed defender of the Earth. And he never goes back: from this story on, whether it be unmasking Koquillion or defeating the Carsenome, the series is taking a decisive move in making the Doctor the hero in his own series – and in so doing, guaranteeing the show’s survival if William Russell decides to leave. But while making the Doctor a hero, The Dalek Invasion of Earth has one more nasty trick up its sleeve – what is given with one hand is taken away by the other. A wise man once wrote “he who wins shall lose” – and although the Doctor wins his first Earth-saving victory here, he does it at a terrible cost. One of his later incarnations says, “When you have something precious you run and run and run”, presumably referring to the flight from Gallifrey with Susan in tow. And so what should have been a triumphant moment, like so many later victories against the Daleks, is made bittersweet by the departure of someone the Doctor loves. His farewell to Susan, the choke in his voice as he says, “Goodbye my dear”, is the most moving moment in the first year of the series. It’s the first time he, and the audience, have had to say goodbye to a regular character. And it rightly hurts. In later years, Sara Kingdom, Tegan, Rose, Donna, even Ian and Barbara, will leave the Doctor after a battle with the Daleks. But you saw it here first. The Doctor, the man who saves the world, can never settle down, living a life, day after day, never rest, because there are always more evils to be fought, more stories to be told. Once he started running he never stopped. And his tragedy is that no-one else, not even his own granddaughter, can keep up with him forever.